For my card today, I chose to work the inviting wreath image from JB-09775 From Our House. Next, I pulled out a couple of my favorites -- a great sketch (Karen's Sweet Sunday Sketch #85) and new pretty paper (from Basic Grey Jovial). I stamped the wreath 3 times and colored it with Copic markers and Spica Glitter pens. I also stamped and colored the border, cut it out like a frame and popped it on top of the center image (the center image is double popped for more dimension). I added a couple of layers of holly punched edges and some stitching. Note: When I went back to link to Karen's challenge, I noticed that she is having a double challenge this week. The extra challenge is to create a birthday card for Operation Write Home (for men and women serving in the armed forces). If you haven't heard about this organization before, please click on the link for more information! Great border punch!!! Wonderful card!!! Very stunning! I love the sewing (have yet to try it) and the border punch! Wonderful! That holly border just brings it altogether! Oooooo, how elegant, Stephanie! Love the border punch! wow...beautifully done. love the stitching and the border trim. A rich and elegant design! WOW! 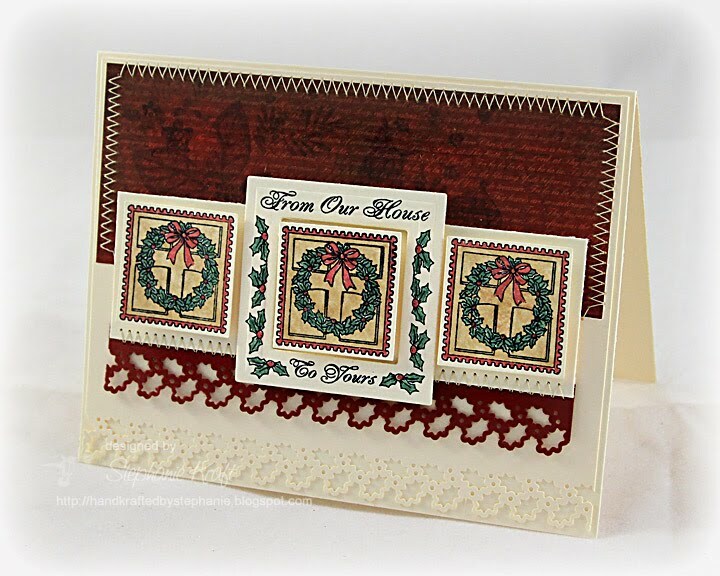 The stitching is fabulous and the colors are so elegant - what a great border in burgandy and white! Beautiful! Beautiful work, Stephanie! The border is simply awesome, as is the stitching! beautiful card Stephanie - I love the holly border! What a beauty, Stephanie! Gorgeous work, as usual! WOW, fancy card, elegance comes to mind too. Nicely done and thanks for sharing. Ohhhhhh, I love this! Such a warm and cozy feel, and that's what I associate with Christmas. Beautiful! Stephanie this is gorgeous!!! 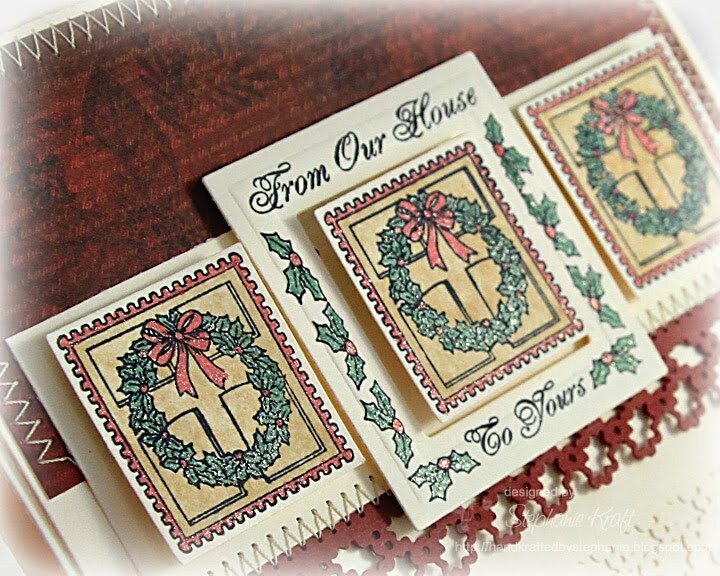 Love the vintage colours, sewing and punched borders, not to mention the fabulous use of the stamps!! Gorgeous card, Stephanie! I HAVE to go find that border you used...it's AWESOME! How elegant Stephanie. This is one of my favorites. 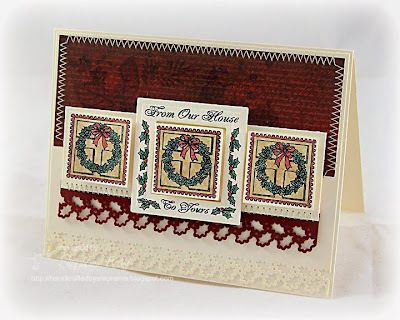 I love the punched border and those stamps are awesome. Beautiful Holiday Card !! Gorgeous card! love the holly border. The images are fabulous and the layering. Oh so pretty Stephanie! Great job coloring all that lil' detail!